In some games, you may have multiple characters that the player follows throughout the story. Depending on the plot, players may be asked to play through each character’s scenario separately, and each character’s performance may affect the rest of the plot, including other characters’ scenarios. There may even be cases where you cannot choose to play every character’s scenario in a single run. This is when you would like players to choose which scenario they would like to play. But how would this be done? The RMDev Challenge is a series of challenges that present a gamedev problem for RPG Maker developers and the objective is to find a solution. The purpose is to engage RPG Maker developers in some (possibly practical) problem-solving that will allow them to explore more of what the engine has to offer, and also to see how others solve the problem. You may present your solution however you wish and wherever you wish, but I ask that you leave a link back to this challenge page if you are sharing a solution on external sites. 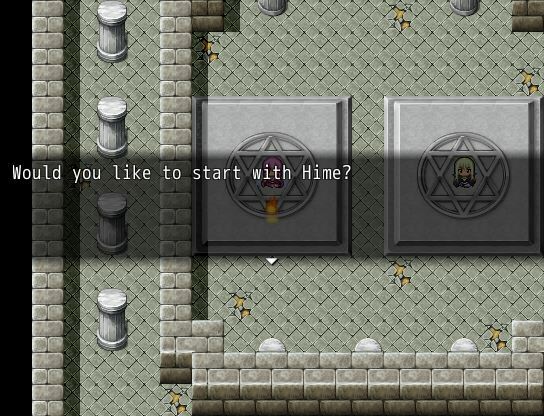 The challenge is also available on the official RPG Maker forums. All participants will receive a slime medal. It is a picture of a medal with a slime on it. Gets the job done. But does it seem aesthetically appealing? It might, depending on the style you are going for; after all, consistency is important. Both accomplish the same thing in the end. What differs is the presentation. Your goal is to create a character selection screen. Your game will have four characters. However, not all of them are selectable at any time. 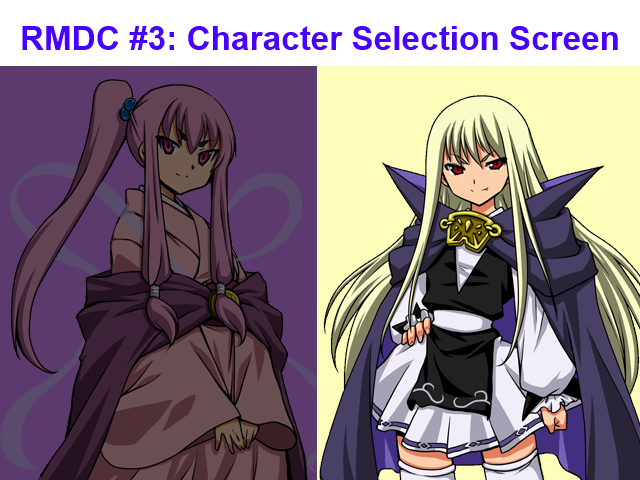 In the beginning, you will see three characters available on the screen, but only two characters can be selected: the third character will be displayed, but is locked from selection. After clearing one scenario, the third character is unlocked, and the character you initially selected will now be locked because their scenario has been completed. There is a hidden fourth character that will become available when you complete certain tasks. For practical purposes, you can simply use a switch to determine whether the character should be shown or not. In the end, depending on whether the fourth character has been unlocked or not, you will be able to go to the character selection screen and choose which character you wish to use for the final battle and the ending. Here is a list of submissions. Let me know if you would like to be added to this list.